Welcome to another January, 2014 issue of GL Communications' Newsletter providing information and insight into our latest product MAPS™ BICC IP Emulator- Scripted Bearer Independent Call Control Protocol Emulation over IP. 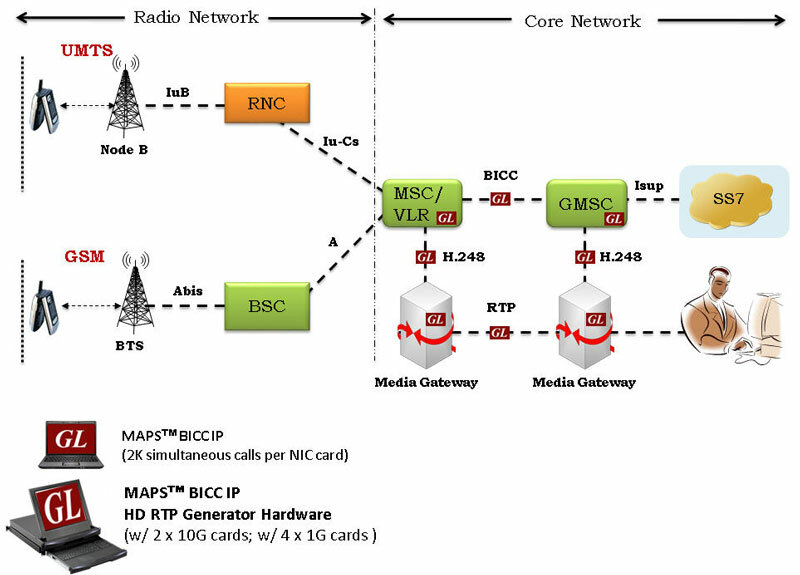 The Bearer-Independent Call Control (BICC) is a signaling protocol based on ISUP that is used for supporting narrowband ISDN service over a broadband backbone network without interfering with interfaces to the existing network and end-to-end services. Specified by the ITU-T in recommendation Q.1901, BICC was designed to be compatible with existing networks and for that matter with any system that is capable of carrying voice messages. MAPS™ BICC IP Emulator is used to emulate all the BICC interfaces over both TDM and IP. It is designed to specifically emulate BICC call control signaling as defined by ITU-T standards between Mobile Switching Centre (MSC) and Gateway MSC (GMSC) server nodes. MAPS™ BICC IP Emulator can run pre-defined test scenarios against test objects in a controlled & deterministic manner. In addition, it also supports error tracking, regression testing, conformance testing, load testing, and call generation. It supports powerful utilities like Message Editor, Script Editor, and Profile Editor which allow new scenarios to be created or existing scenarios to be modified using BICC IP call control messages and parameters. Ready scripts makes testing procedure simpler, less time consuming and hence time to market products. The screenshot below shows MAPS™ acting as MSC/VLR and sending the Initial Address message to GMSC. The Tx script also ensures that once the call is established auto traffic with voice file transmission is initiated. The screenshot below shows MAPS™ acting as GMSC node and responding to the Initial Address message from MSC. By default, all call handling scripts (irrespective of the type of the functions) are assessed by MAPS™ to provide statistical information about Total Calls, Active Calls, Completed Calls, Passed Calls, Failed Calls, and Calls/Sec. It is also possible to characterize the statistical information under different groups of call handling scripts under a unique heading. The enhanced Message Stats feature provides the count of protocol messages transmitted and received during the call, thus allowing users to monitor the real-time events. In addition, Call Generation and Call Reception windows provide useful call status & script execution results. For comprehensive information on the application, you can refer to the MAPS™ BICC over IP Emulator web page.